I've been seeing a lot of people who doesn't know how to get the orange outfit that they want, so I've decided to write up a quick guide on how to do it. 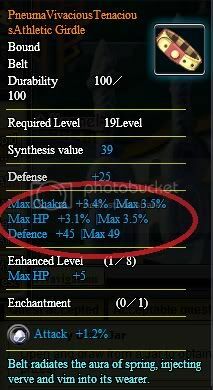 This is a 1 Stat item, the stat is circled. All 1 stat items have a synth value of 22. This is a 2 Stat item, the stat is circled. All 2 stat items have a synth value of 31. 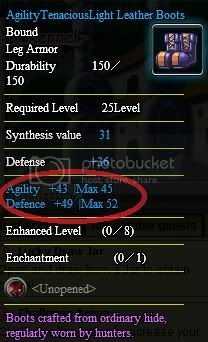 This is a 3 Stat item, the stat is circled. All 3 stat items have a synth value of 39. Fight in the arena for medal so u can open some jars. Go to an item shop in any village or demon city and buy all of the items with 1 stat on it. 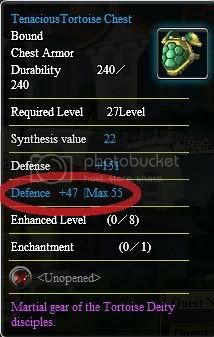 Once you have more than three items with 1 stat on it, use rapid synthesize and craft the 3 items together. You need to get two pieces of 2 stat equipment for each grey outfit. If you run out of 1 stat items and you don't have enough 2 stat items yet, just refresh the item shop (costs less than 100 stone, goes up was you level) and buy more. Repeat until you have 2 blue outfits and move on to step 4. Put the orange outfit in the first slot and two 1 stat items in the other slots and synthesize them and you will have a 100% chance of getting another random orange outfit. Repeat until you get the one that you want. Once you've reached level 16 and have gone to the crossroads you'll have probably seen the slot machine there. If you join a party and beat the enemies in the slot machine they will drop 2 stat and 3 stat items. The drops are not constant, you can have 2-3 battles where you don't get any rewards at all or get 3 items in one fight. Also a good thing for people to know is that there is no specific way to get a characters outfit, each outfit is completely random..
Dude thank you so much man now i have a Tsunade suit I would have never been able to do this without you, Thanks! Oigan La Tecnica De Blue outfit + Blue outfit + 3 stat item = Orange outfit !! Siii Sirveee ??? thnx alot!! !☻ <= Black guy smiling lol! I crafted one with the short list without using any stones or gold through the newbie pack on my first day of playing.